A Google search for “Hibernate and performance” will yield innumerable articles describing how to fix performance issues. This post is not yet another performance improver. Instead we will demonstrate how to remove bottlenecks in your Hibernate project by using JPA support in Spring boot in tandem with in-JVM-memory snapshots which provide speedups of orders of magnitude. Let us use the Sakila sample database for the purpose of this post. The database contains, among other things, Films and Actors and relations between them. While the stream construct with which we started out in the section above was very inefficient, it has appeal in the way that it abstracts away the details of the database operations. The ORM Speedment has a Streams based API allowing stream operations to be efficient. The Speedment based application code is very similar to the Hibernate example with the exception that the Repository is replaced by a Manager and this manager provides streams of entities. Thus, the corresponding Speedment application code would be as follows. For this particular example, the Query based Hibernate solution was approximately 5 times faster than the naive approach of streaming over the full set of entities. The Speedment powered solution returned a result 50 times faster than the Query based Hibernate solution. If you try it out, your mileage may vary depending on setup, but clearly the in-memory snapshot will invariably be orders of magnitude faster than round tripping the database with an explicit query which in turn will be significantly faster than fetching the full table to the JVM which happens in the naive implementation. While in-memory acceleration does deliver unparallelled speed it is no panacea. For some tables, a speedup of several orders of magnitude may not yield any noticeable effect on the overall application. For other tables, querying an in-memory snapshot of data may not be acceptable due to transactional dependencies. For example, operating on a snapshot may be perfect for the whole dataset in a business intelligence system, a dashboard of KPIs or a tool for exploring historical trade data. On the other hand, the resulting balance after a bank account deposit needs to be immediately visible to the online bank and thus serving the bank account from a snapshot would be a terrible idea. In many real-world scenarios one would need a solution where some data is served from a snapshot while data from other tables are always fetched from the database. In such a common hybrid case, the code that directly fetches data from the database may use the same Speedment API as the snapshot querying code but for projects already using Hibernate it works perfectly well to combine Speedment and Hibernate. Since both Hibernate and Speedment rely on JDBC under the hood, they will ultimately use the same driver and may therefore work in tandem in an application. Having a Hibernate powered application, a decision to move to Speedment for bottlenecks can therefore be local to the part of the application that will benefit the most. The rest of the Hibernate application will coexist with the code that leverages Speedment. Scalability of a cluster is often perceived as a matter of being able to scale out, but in practice the constraint of latency may be at least as important; it does not really help making a system future proof in terms of data size capacity if it turns out that handling an increasing amount of data will render the system intolerably slow. This post gives a high level idea of the concept of sharding. We will elaborate on the principle in general, how it relates to affinity and speed and then present some code examples of sharding usage for low latency. There are many problems that can be solved by dividing the problem into smaller subproblems and then assembling the subresults. In a cluster environment where several nodes cooperate to deliver a service, such a divide and conquer strategy may turn a single intractable problem into several smaller and therefore solvable problems. If the size of the data is too large for any of the cluster nodes, the cluster may still be able to handle the service if the data can be partitioned between the nodes. The strategy of partitioning the data in a way that it lends itself for local computations is often referred to as sharding. A simple example would be a directory lookup service. Let us say we design a clustered lookup service which will return the phone number of a person given her name. Let us assume that the size of the lookup table is more than what we can fit into a single node. This means that the nodes will need to cooperate somehow, and divide the lookup table data between them. In this example, there keys to the lookup table are totally ordered. Then it is easy to devise threshold values by which we partition the keys. We may for example say that the first node holds all names that appear before Charlie in the alphabet and the second all names between Charlie and Delta and so on. The name is then what we call a shard key which we use to determine node given key. Having a strategy for how to find the node given a key, it is easy to devise an edge service of our cluster that given a node routes the request to the proper node. In the simplistic example of phone directory lookup, the problem can always be solved at a single node and the reply from that node will constitute the reply from the cluster. In a more realistic scenario, the nodes involved may be any subset of the nodes, perhaps all of them, the response from the service is then some kind of accumulation of the subresults. Further, in this example the shard key is identical to the actual input data but in a more realistic scenario the shard key may be a subset of the input data. The sharding function from shard key to nodes is in general a hash function, or more theoretically a surjective function from shard key to node. What we have gained in the example of the phone directory is that we have transformed a problem that needs a large amount of data to be solved into several smaller ones by exploiting locality properties of the problem domain. Clearly, such an efficient divide and conquer strategy does not exist if the data cannot be partitioned in any meaningful way. However, even without the nice property of the total order of keys in this problem, we could divide the data by some other shard key and still deliver the service by just asking all nodes to help. If we for some reason have partitioned the person data by age of the person, that partitioning will be of little help in directing the search by name. Without the help from an index, the service may still be able to deliver a result be sending the request to all nodes and then assembling the subresults. While this helps addressing the problem of the size of the data in each node, it is much less efficient than a shard key that helps narrowing down the search. Sharding helps combating overwhelming sizes of data, but it may also be a major factor in speeding up computations. Not only by narrowing down the search as demonstrated in the previous paragraph but also because reducing the amount of data needed will allow for lower latency. When dealing with low latency computation, affinity becomes paramount. The sheer computing power of the processor is however mostly not the only bottleneck. To consider the processor speed as a major limiting factor of the computation time one has to assume that data is readily available when needed, and in real-world situations that is often far from the truth. No matter how clever algorithm the designer of the system has devised, and no matter how fast the processors involved can process the data, the time needed to compute the result is bounded by the time needed to bring the input data to the processor. In a computing setting, the term affinity is often used to refer to the action of associating a process to a particular processor, often called the kin processor. Having a kin processor, the process will benefit from having intermediate results and state readily available in the processor registers and caches when it gets scheduled to perform work. Ascending the level of abstraction from processors and caches, it also makes sense to use the term affinity for input data available to computing nodes in a cluster. In the following we use the term in this higher level of abstraction. A computing cluster where the nodes have all needed input data available in RAM at all times has the highest degree of affinity while a system where the input data needs to be fetched from remote nodes before computation can complete has a lower degree of affinity. For a computing cluster with no data redundancy and with data randomly spread out over the nodes, the computing time as function of the number of nodes in the cluster will asymptotically behave as if no data is ever available where it is needed. When there are ten nodes, there is a chance of 1/10 that the needed data will be available, but this chance diminishes as the cluster grows. Since the time needed to transfer data between cluster nodes is several orders of magnitude larger than fetching it from local RAM, keeping the data close at hand is paramount to achieve really low latency. The random distribution of data is a worst case example and there are many elaborate approaches to increasing the chances of having data available when needed in a computation cluster, but in some cases the problem domain per se actually allows proactive distribution of data that fits the usage pattern and then we may use sharding to achieve ultra low latency for really large data sizes. Scalability of a cluster is often perceived as a matter of being able to scale out, i.e., adding more nodes to the cluster as the size of the data grows. While the ability to handle the sheer size of the problem clearly is a non-negotiable limitation of the system, it may not be the bottleneck. In a non-sharded system, the likelihood of having data available when needed asymptotically approaches zero as the size of the problem increases and this lack of affinity has an impact on computation speed. All systems become obsolete at some point, and when that happens it may very well be because the system is unable to hold the increased set of data, but another common reason is that the system simply is too slow. Two major factors come into play; the increasing amount of data requiring more nodes with added data transfer latency as a result and also evolving requirements on the system - quite often new applications demand more complex computations. Wasting time on data transfer and being asked to do heavier work turns the once competent system into an obsolete object for a migration project. We conclude that theoretically scalability is just one pice of the scalability puzzle. Latency as function of data size and problem complexity cannot be fully ignored in a real life scenario. Focusing from general computation theory into the more specific domain of Java server side development, we use the term in-JVM-memory to refer to a computation strategy where each node has all its needed data directly available to the JVM without the need for fetching it, even from other local memory. Thus taking affinity to the extreme, this strategy allows for ultra-low latency. Clearly, this requires all the node data needed for the computation to fit in available memory and that clearly poses a limitation to the size of the problem that can be handled. Since a low latency system using in-JVM-memory data needs all data to fit in the available memory of the node, sharding will be needed to address situations where the data is larger than what can fit in the memory of the node. Therefore, sharding support is a key feature of a scalable in-JVM-memory system. Concluding this rather theoretical post about scalability of low latency clusters we give a few real examples of sharding support. We will use the Java stream ORM Speedment, which has an acceleration feature that relies on in-JVM-memory techniques. When the shard key values are known apriori, all sharding details can be given at startup time. Further described in the manual, the following example allows for creation of two sharded computation engine instances for shard keys A and B. Then, at other nodes, other shard keys can be used and in such a way the nodes of the cluster divide the data between them ensuring that the first node has all data needed for solving problems in the part of the space of data determined by shard keys A and B. // Creates a builder from a shard key. // Creates a ShardedSpeedment object with two keys "A" and "B"
The node that runs this code will only handle data related to countries starting with letters A and B. Other nodes will be handling other countries. Now, this partitioning of the data is quite static and while it sometimes suffices, a more general approach is needed if a more flexible sharding strategy is needed. With Mutable Sharding we allow the cluster shards to be added dynamically. When the set of shard keys is unknown at startup, mutable sharding can be used as follows. In contrast to the example of immutable sharding, we here allow for adding new keys to the sharding scheme during the life cycle of the application. More details are to be found in the manual. // Acquires a Speedment instance for the shard key "A"
To download and try Speedment out, there is a Speedment Initailizer, you can find here. The Stream ORM Speedment has received a nice feature in the latest release. While traditionally focused on accelerating database reads, Speedment has always also had database write functionality. In the latest version a much anticipated feature has been added - the ability to determine a subset of columns to update. Persisting data in Speedment follows the same intuitive stream approach as other Speedment data oriented operations. Just as querying the database is expressed as a stream of operations on data items, the POJO entities received from the database may be persisted to the database by simply terminating the stream in a database persister. which will find a POJO representing a row in the underlying database for which the supplied predicate holds true. In this case, the user will get a film longer than two hours, if any such film exists. For reading data, Speedment thus supplies a stream source that represents the database, in this case the films instance which runs code generated by Speedment. Analogously, Speedment defines a stream termination that handles data writing which can be used as follows. Here we create a stream of POJOs representing rows in the database that may not yet exist in the database. The languages instance on line 3 is a Manager just like films above and is implemented by code generated by Speedment. The persister() method returns a Consumer of POJOs that will persist the items to the database. Since Speedment provides a consistent API of treating database operations as stream operations on POJOs, the reading and writing of data can be composed and combined freely. Thus, a POJO retrieved from a Speedment source is the very same kind of POJO that is needed for persistence. Therefore, it makes a lot of sense to use streams that have both source and termination defined by Speedment. If one for example would like to update some rows of a table of the database, this can be done in the following concise way. Almost self-explanatory, at least compared to the corresponding JDBC operations, the code above will find any Language named “Deutsch” in the database and rename it to “German”. The terminating operation here is the updater which in contrast to the persister modifies existing rows of the database. The basic updater will update all relevant columns of the row in question, which makes sense in many cases. However, for the case above when updating a single column of the database this behaviour may be wasteful or even prone to errors. Even if the code above intends to update only the name of the language, since the updater updates all columns of the row it will actually update the name to a new value and also reset all other columns to the values they had when the POJO was created from the database. If this code is the sole actor modifying the database this may be a minor problem, but in a concurrent environment it may create undesired race conditions where this innocent update of a single field may happen to undo changes to other columns. Generally accessible in Java 8, higher order functions open up a whole new level of abstractions allowing us to reason about code and algorithms in a new way. When our code can operate on functions as input and output we are given the power to easily express algorithms that modify behavior just like we have always done for data. The power to create algorithms that modify behavior makes it possible to reason about functionality. Such a higher order algorithm can therefore extend or optimize the characteristic of a function, before the function receives any input. Speedment is an Open Source ORM with an API founded in Java 8 streams. This post describes some new features of the API of recently released Speedment version 3.0 which add more features to support higher order functions. A reader already familiar with higher order functions and declarative programming may benefit from skipping ahead to the last section. To many developers, there is a fundamental difference between functions and data. A common view of a traditional program is a clear separation of the two; the program is a static structure of procedures and functions determined at compile time which operates on data, part of which typically is supplied at runtime. For example, it is natural to have a program that prints a sorted list of names that are given as input. When compiled, the sorting function is static but can dynamically be used on any data that happens to be a list of names. If our program was to be generalized to take the actual sorting algorithm as input, we have created a higher order function since our program accepts a function as input. Seen in such a way, functional aspects of Java are not new. Supplying a function as parameter is commonplace in Java, perhaps most notably as event driven callbacks for asynchronous interfaces. The callback idiom is a very simple type of operation on functions since the function itself is never altered - it is just kept as a reference until the time comes to call it. The concept of higher order functions entails not only that functions can be referred to and invoked within the framework of the language itself, but also that functions are treated as other data on which other functions can operate. A better example of the power of functional programming in Java 8 would showcase modification of an existing behavior. Even though not obvious from syntax, the Java 8 concept of streams does exactly that. Consider the following code. A reader used to for example unix pipes would perhaps interpret this algorithm as a source of data creating an unbounded sequence of integers on line 1, doubling each number on line 2, removing the numbers evenly divisible by 10 on line 3 and then on line 4 throwing away all numbers except for the first 10 before printing them when reaching line 5. Actually quite far from what will happen when the code is executed, this is in a sense a very useful intuition. This lazy evaluation is possible since the program describes the requested operations rather than actually executing them. What at first may seem like a simple sequence of function invocations on a sequence of integers is actually a creation of a function that is passed to another function. By using higher order functions we decouple the declarative description of the function from the imperative interpretation. The program simply describes what is computed while leveraging previous work invested in the design of the used stream components which determine how the computation will take place. Functions operating on other functions allows blissful ignorance of (and therefore also decoupling from) execution details. Decoupling of algorithm from executional details is also the reason why parallelism can be so elegantly implemented for Java 8 streams. The following code will utilize available processor cores to parallelize the work of the stream. This small alteration of the stream will yield fundamentally different execution characteristics. In this case, the parallel version is likely to be more wasteful than the original version. The typical implementation of a parallel stream, the Spliterator, will partition the stream of integers in chunks processed concurrently. Since several threads are helping out multiplying integers by two and filtering out numbers that are multiples of ten, the limit operation which requires synchronization between the parallel workers will be fed with more numbers than it will allow to pass through. The first non-parallel example would pull items from the source when needed, stopping just when the limit is reached. Similarly to the declarative example above where the composer of the stream describes what to calculate rather than how to do it, the typical user of a relational database is used to query the database by means of the declarative language SQL. Compared to the number of software engineers that have ever designed software that uses data from a relational database, very few are actually concerned with the details of how the database engine cleverly executes the query. An ORM provides a mapping between the data model of a relational database and the object centric view of an object oriented language such as Java. The Java 8 stream ORM Speedment provides such a mapping with a fully declarative Java 8 stream API. the Java 8 streams features provide a similarly declarative approach to design of the operations on the data once retrieved to the JVM. However, without Speedment the two declarative languages have to be mixed in an application. 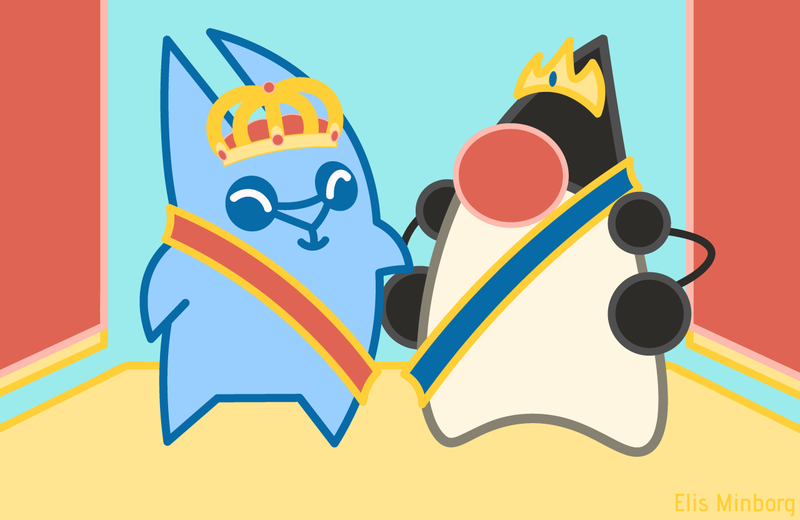 In a previous post on this blog we have seen that the designer has to suboptimize two separate programs; the declarative description of the data to retrieve from the database and then in a separate language the operations to perform on that data in the JVM. The language barrier between the database engine and the JVM forces the designer to design, optimize and then maintain the structure of the data as transferred from the database since it constitutes output from the first part of the solution and input to the next. Taking the declarative approach from its starting point in two declarative building blocks all the way to its logical conclusion of a unified declarative construct, Speedment abstracts away the SQL query and allows the user of the framework to create a design based solely on streams. Consider the fully declarative Speedment way of counting the users belonging to a particular department in the following code snippet. The source of the stream is a manager instance called users. As described in length above, viewing a stream as a sequence of objects flowing from the source and modified on each following line will give the correct understanding of the result of the operation while not necessarily any insight to the actual execution of the program. The same applies here. Retrieving all the users from the database in line 1, then in line 2 filtering out the users belonging to department number 1 and finally counting the remaining users would yield the desired result of the operation. This understanding of the algorithm has a strong appeal in its abstract simplicity and allows the Speedment framework to decide on all the details of the execution. Not only does Speedment optimize the operations on the data in the JVM, but since also the relational database operations are covered by the abstraction the SQL query will be created by Speedment taking the full pipeline of operations into account. By means of a sequence of reductional operations on the pipeline Speedment will collapse the operations to a single SQL statement that relieves the JVM from any operations on user instances. The executed query will actually be as follows. As showed above in the example of the parallel streams, in a declarative setting where the framework makes decisions on execution strategy it is easy to reuse a declarative program in a new setting with completely different executional properties. In its enterprise version, the Speedment framework may also chose to execute queries using data from an in-JVM memory data store, improving database latency by orders of magnitude without changing a single line of the declarative program describing the business logic. Recently released Speedment 3.0 adds improved API support for higher order functions. While the runtime framework SQL optimization of those constructs is not yet finished, it allows design of more complex and elegant declarative programs that are prepared to be executing more efficiently in later versions of Speedment. The following code can be used to set the “category” property to 3 for all users born in a particular range of dates. The updater construct is new in Speedment 3.0 and lends itself to executional optimization in the Speetment framework since if the preceding pipeline has suitable properties the whole update operation pipeline may be collapsed to a single SQL UPDATE statement. While version 3.0 of the framework does not perform all the possible optimizations to collapse the pipeline to a single SQL statement, the program will yield a correct result by a sequence of UPDATE operations. Another example of the extended support for higher order functions in Speedment 3.0 are the categorizers. Functions designed to work with the standard Java stream operations, the categorizers allow constructs such as the following which creates a mapping from users to their homepages assuming a homepage has a foreign key pointing to its owner. As we have seen in two examples above, the beauty of the declarative programming paradigm is that executional properties are abstracted away. When the Speedment framework in a later version implements all the needed optimizations, existing Speedment leveraging applications will start emitting smarter SQL queries to the relational database as soon as they use the newer framework version. A dream come true from an application maintenance perspective, the declarative program describes a solution and therefore remains the same since the problem it solves is the same. Coming from a software development background mainly rooted in Java I have spent roughly two years away from the Java world, exploring the wonderful aspects of embedded system design in the automotive industry. Taking on new challenges yet again related to Java is a cognitive homecoming of sorts for me while the spatial aspects of the new job initially entail transatlantic commuting. My first California visit on the new job at Speedment Inc luckily coincided with the JavaOne 2016 conference in San Francisco. The story that you are about to read is about one particular encounter at this for me very inspiring event. You will learn about Hares and Reindeer, Nordic cooperation at its finest and a perfect match of frameworks creating an inspiringly elegant hello world web application rendering data from a relational database in a browser. TL;DR: Jump directly to the take home message or the code in case you do not want to indulge in the full narrative. At the conference JFocus in 2013, there was a consensus that Java felt dated as compared to more modern languages such as Scala and Groovy and suffered from somewhat deserved lack of enthusiastic backing. 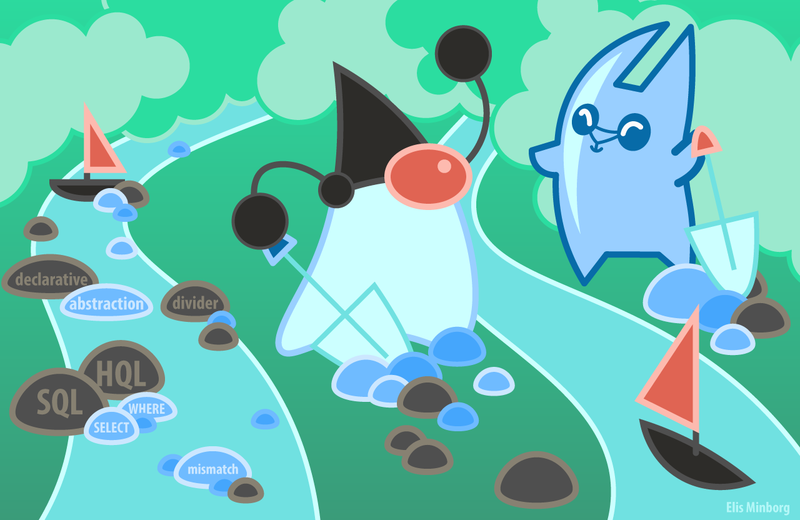 The upcoming Java 8 promised great progress, however, and it was repeatedly stressed that the future for Java looked brighter than the recent past since the new concepts of streams and lambdas would modernize the language. Having watched the progress from a certain distance since the automotive industry has a way of absorbing one's attention, it was a delight to be back in 2016 to what seemed quite similar to the bright future pictured a few years ago. The future progress promised in 2013 had not only materialized but also been widely embraced. The functional paradigm of Java 8 lambdas and streams had not been received as just a facelift but as the fundamental gamechanger it actually is. Attending a big conference when just having started a new job is a great way of getting a feel for the general direction of the industry and the way the product of the company is received. An inspiring and greatly informative quick start, participating at such a major congregation immediately tells what parts of our product actually peak others interest and what kind of questions arise during follow-up discussions. I learned from several enthusiastic exchanges that Speedment bringing Java 8 style functional programming in an innovative and uniquely consistent way to the realm of relational databases was the key factor that caught others attention. The most inspiring interaction was probably with UI framework designers Vaadin. Creating a framework that can be described as AWT/Swing for the web done right, Vaadin brings elegant programming of web interfaces to Java. Delivering relational data to Java in a way very similar to what Vaadin expects as input, Speedment seems at first glance to be the perfect match with Vaadin and together the two frameworks could in theory bring relational data to the web allowing minimal boilerplate business logic in between. Capturing the spirit of the meeting the graphic illustration of this blog post is inspired by painter John Bauer and pictures a reindeer and a hare working together. 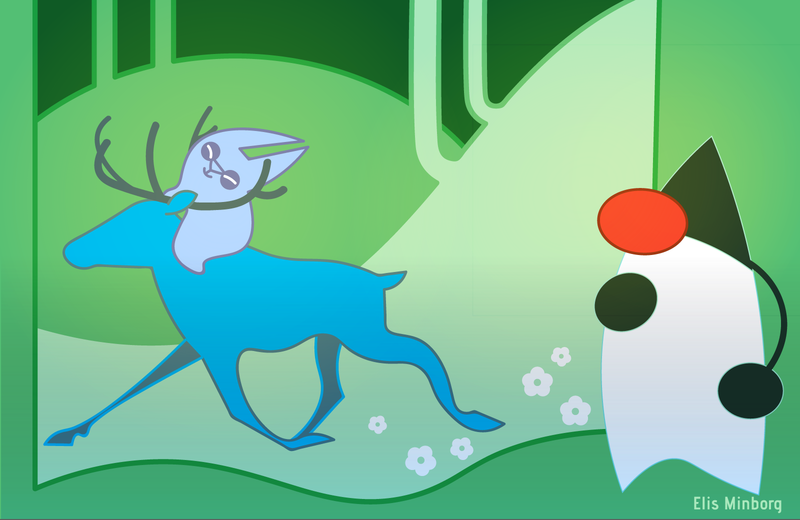 With its roots in Finland, Vaadin has a Reindeer mascot. Speedment has Swedish heritage and mascot Hare. Nordic people may not be known for overly expressive outbursts of enthusiasm, but I believe that I displayed my excitement with an average of more than one positive word per sentence and an occasional smirk that may have resembled a smile. Thus expressing profound enthusiasm (bordering the socially acceptable in my home country) about the promising outlook, we decided to try it out. What about trying to get Vaadin and Speedment work together there and then at the exhibition hall of the conference? We are able to reason about fundamentally complex systems much due to our ability to perform agile transitions between different levels of abstraction. Roaming the realm of higher abstractions, we allow ourselves the luxury of turning a blind eye to details, enabling us to find patterns on a larger scale. When descending the stairs of abstraction to lower levels we often find ourselves knee deep in a swap of complicating details. Additionally, when talking about newly found synergies, one only has deep knowledge about a limited part of the problem since otherwise the topic at hand would not be new in the first place. Compared to thinking within one’s knowledge comfort zone, reasoning about something one does not really know typically gives rise to much creativity and rejoicing but increases the risk of creating things that simply do not work. Well knowing this, setting out to create running code right there on the exhibition floor seemed like a fun exercise yet doomed to run into some obstacle, no matter how clean and perfect the match does initially seem. It would turn out that the expected obstacles never materialized. Granting myself some philosophical leeway, I submit to the reader that many great things that are considered to be invented are actually rather discovered. Instead of being born as the result of a creative process, they were in some ontological sense present all the time waiting to be found. I would say that the application that emerged in my laptop while bright minds of Vaadin and Speedment contributed with each part of the solution was the result of the two frameworks being cleverly designed, rather than an inspired act of invention in that busy exhibition hall. After some ten minutes of coding no more than standard instructions of the respective framework, the browser of my laptop rendered data from a table of an SQL database. The data was delivered by Speedment, manipulated in straightforward Java 8 code with minimal boilerplate and then sent to Vaadin for rendering. One reason that this application worked more or less out of the box is that Vaadin and Speedment agree on using standard Java constructs in their interfaces. Had there been any special constructs used for any of the frameworks, the code would be bloated with adapting boilerplate. For the toy example we started out with one of our example databases. The table of interest in this example is a table of hares that have name, color and age. The business logic of our toy example is minimal, the following declarative code describes filtering out hares that have age above 3 and collecting them in a list. The Speedment framework has an API founded in Java 8 streams, a fact that was the major cause of excitement when describing Speedment to people I met at JavaOne. For further reading on that topic, please see for example this previous blog post. The first line starts out the description of an operation pipeline operating on a stream of hares from the database and the second line adds a filter to the pipeline telling Speedment to find hares of the desired age. The last line terminates the pipeline, defining the result as a list of the filtered hares. Having a list of beans, a table of the Vaadin framework can be populated by the following piece of code. The code shown so far is all the business logic code needed to get a live view of the database content in the browser. Asking the database for the contents we happen to find 4 hares. Our business logic described above filters out the hares with age strictly greater than 3, yielding two lines of the table presented in the browser. A promising feature for a future blog post about Vaadin and Speedment is the lazy loading of MTables. It seems quite straight-forward, and probably interacts nicely with Speedment creating streams of data instead of a fully instantiated list. The upcoming Vaadin 8 API promises to take Java 8 support to a higher level. See for example this blog post. I look forward to exploring how this may enable even more elegant Speedment Vaadin interaction. Are you a web application developer leveraging data from a relational database? 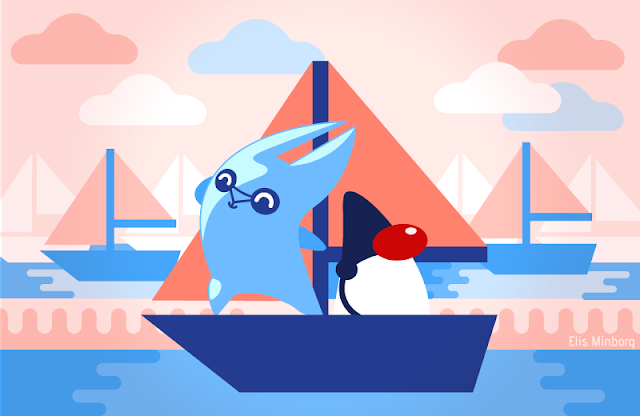 This blog post describes how Speedment and Vaadin provide the ideal framework to create a modern, type safe, easy to maintain and elegant Java 8 streams based application without any query language or cumbersome boilerplate for the UI. I thoroughly enjoyed being there to see this application appear on my screen. It gave me some insight into the Vaadin framework and I took with me new knowledge of how to give a quick visual presentation of the power of the Speedment framework. For a back end tool provider, demonstrating end user value is often an indirect exercise. To show a relevant example of how to use our tool, we need to add some front end presentation and Vaadin is a great match for doing so in the future. The two frameworks seamlessly interacting to create a solution to a toy representation of a real use case, in this case a web application using a relational database, is a sign of relevancy and maturity of both frameworks. What you have seen here is a starting point of more to come, a proof of concept if you will. Since the two frameworks complement each other so well to create a self contained complete example, we will build on this to create more elaborate Speedment web applications using Vaadin . For a developer new to the field, it is very easy to see that the frameworks solve and abstract away the domain specifics and allows the developer of the business logic to create her application using modern standard Java code with minimal concern for boilerplate or framework specific constructs. As described in more detail in for example this blog post, Speedment allows a developer to access the relational database in a declarative way without explicitly creating SQL queries, which allows for very elegant code with low maintenance cost. The proof of concept described here shows how nicely Vaadin provides a web front end that works with Speedment out of the box. The code shown above is all the Java code needed for the application to run. To get the frameworks configured and running, clearly some dependencies are needed in the pom file and the Speedment framework needs proper database credentials. The following steps will get it running by using this github repository as a starting point. Populate the database with some data to make the application result interesting. Clone the github skeleton containing a pom.xml file and the java code from this blog post. Change directory to the newly created git repo. Run the Speedment code generation tool. Enter database credentials in the UI, fill in the schema hares and press the Generate button without changing any defaults to create Speedment code. Run the application. Substitute pwd and user with proper database credentials. With the application running, point a browser to the Vaadin rendered UI located at http://localhost:8080. 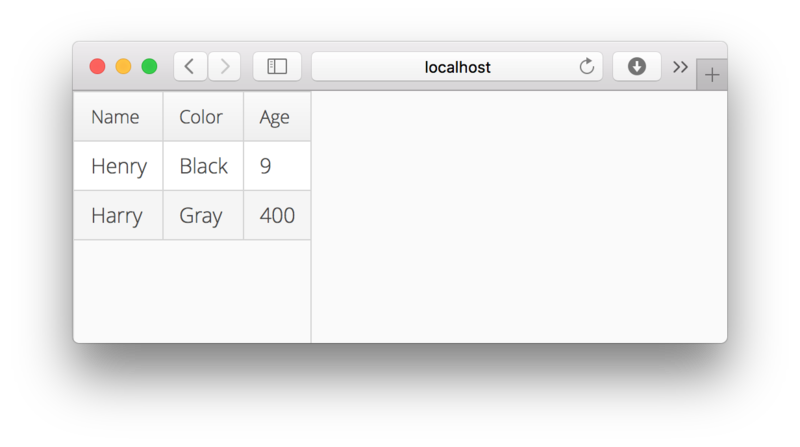 Optionally, add some more hares in the table and reload the browser page to see the data filtered by your application. Edit: Since this post was originally published, Matti Tahvonen of Vaadin has provided valuable feedback and a pull request to the git repo bringing the example code up to speed with the latest advances of Vaadin technology.